On the Christmas of 2005, my dad wanted to take us out for a nice dinner. Now, like many other foreigners we pictured Vancouver to be freezing cold especially since we went during “the dead of winter”. Coming also from a country that’s situated right on the equator, my sister and I layered ourselves with clothing fit for Eskimos before we proceeded to exit the hotel. As we were passing several restaurants, we noticed that their lights were all turned off and their chairs turned upside down. Closed? On Christmas? It was only until we walked a few blocks further that we finally found a Chinese restaurant opened for business. My sister and I had never experience this strange phenomenon. In Singapore, families would go out for a nice meal on Christmas. It’s probably one of the peak holiday seasons where businesses thrive not only from all the Christmas shopping, but also from meals amongst families and friends. To deprive these restaurants from potential business just seemed incomprehensible to us. The meal was great. At the moment I remember being so homesick. (lol talk about the grass being greener on the other side) We headed back for the hotel with our happy stomachs when we passed several houses lit with Christmas lights. I almost felt like I was in a movie while I glanced through the windows from afar as I walked by. Big turkeys amongst a feast of food, Christmas trees, friends and family gathered together opening presents. Laughter, joy and love. Then I thought to myself, “wow, I guess that’s what a typical Christmas is. It sure seems nice..” I couldn’t help but feel a tang of envy. On the years that followed, I learned that Christmas was regarded as “the most wonderful time of the year”. Well there’s a song named after it after all. I got used to stressing out about the presents, going for a million Christmas dinner parties, Secret Santas and feasting on the continuous flow of candies and cookies I’d receive without fail (especially at work). At times I felt like Christmas was completely overrated. And I’m sure it can still be, especially when it has been so commercialized. However, despite all the commercialization, there is still this warm tingly feeling derived from the magical season. The presents and the food are all great but Christmas is really about the people. So this year, I have to say that I’m very fortunate to be with family for Christmas. I’m still in Indonesia and so I won’t be able to celebrate it with my immediate family in Singapore. But I do have a humongous family in Indonesia and I’m excited to spend my first Christmas with them in a long time. So without trying to sound overly cheesy, Christmas is really all in our spirits! From home to home, from heart to heart, from one place to another, I wish you a very warm and merry Christmas! Prepare the pan by laying parchment paper on the bottom. Brush with butter and sprinkle a little bit of flour. Whisk eggs, sugar and vanilla until very thick. Make sure it’s REALLY REALLY THICK. It should take about 5-7 minutes. Let me show you the difference between whisking the eggs sufficiently and insufficiently. 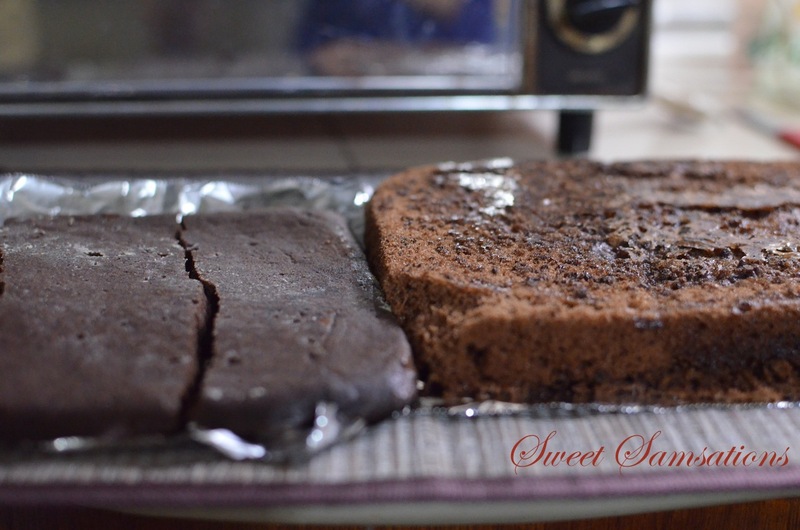 Sift flour, cocoa powder and baking powder into the batter in 4 parts. Fold in gently each time until mixed well. Pour the batter into a jelly roll pan 8″ x 12″ or square pan 8″ x 8″ (24×24). Bake at 180 degrees for 10-12 minutes. Let the cake cool for about 10 minutes. Spread cream cheese filling on the cake and roll while the cake is still warm but not completely cooled. 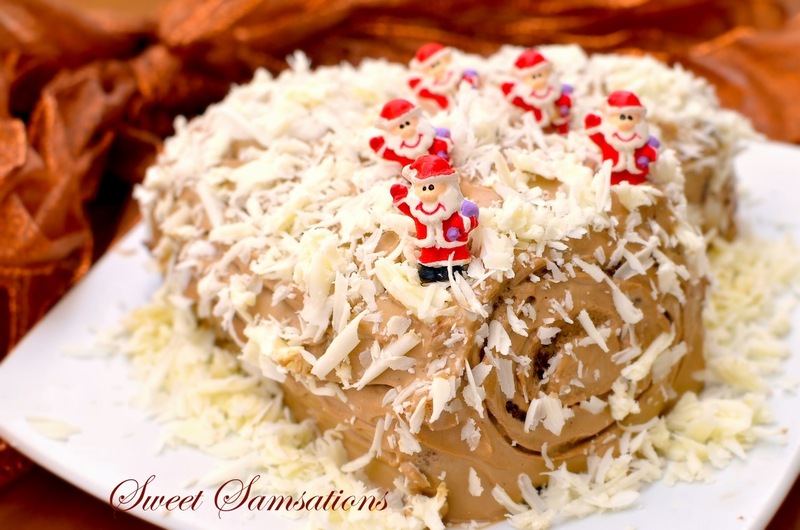 *This whipping cream was great but in my future Yule logs I’d like to try chocolate ganache too! Beat whipping cream until marks start to show. Add the rest of the ingredients in and continue beating until stiff. *I notice that the difference in temperature between Indonesia and Canada seem to be the cause of the whipped cream softening very quickly! Therefore, only make this component when the cake is ready to be frosted! Cut one end of the rolled cake and attach to the side of the cake. 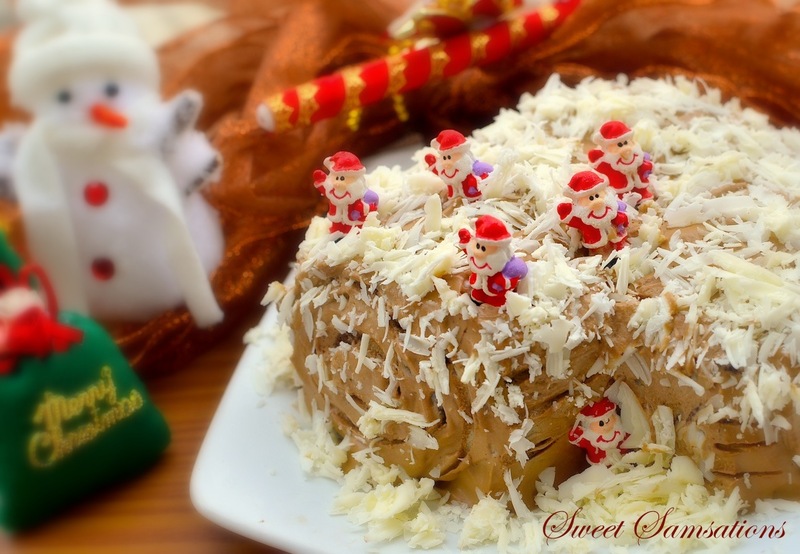 Frost the rolled cake with whipped cream. Use a fork to create lines resembling tree barks on the sides. Use a knife to scrape the bar and sprinkle on top of the cake. Now it’s snowing! 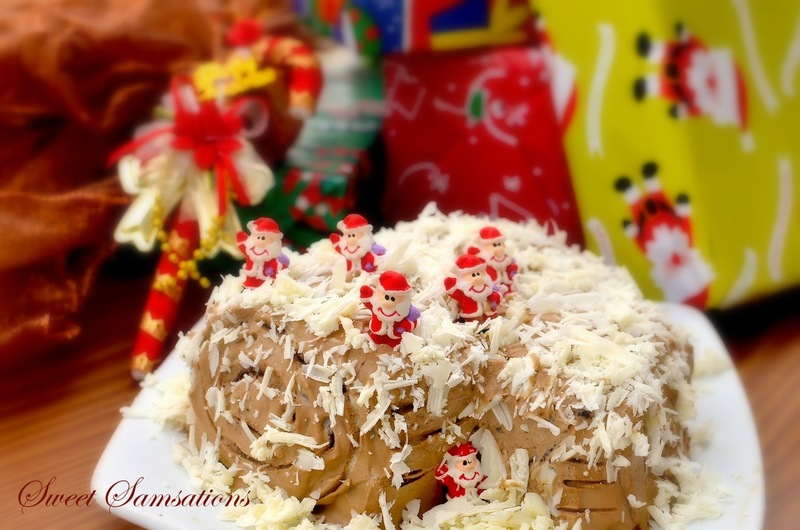 I am also submitting this to Aspiring Bakers #26 – Creative Christmas Motif Bakes! hosted by Alan of Travellingfoodies. Excited to see everyone’s baked goods too!! 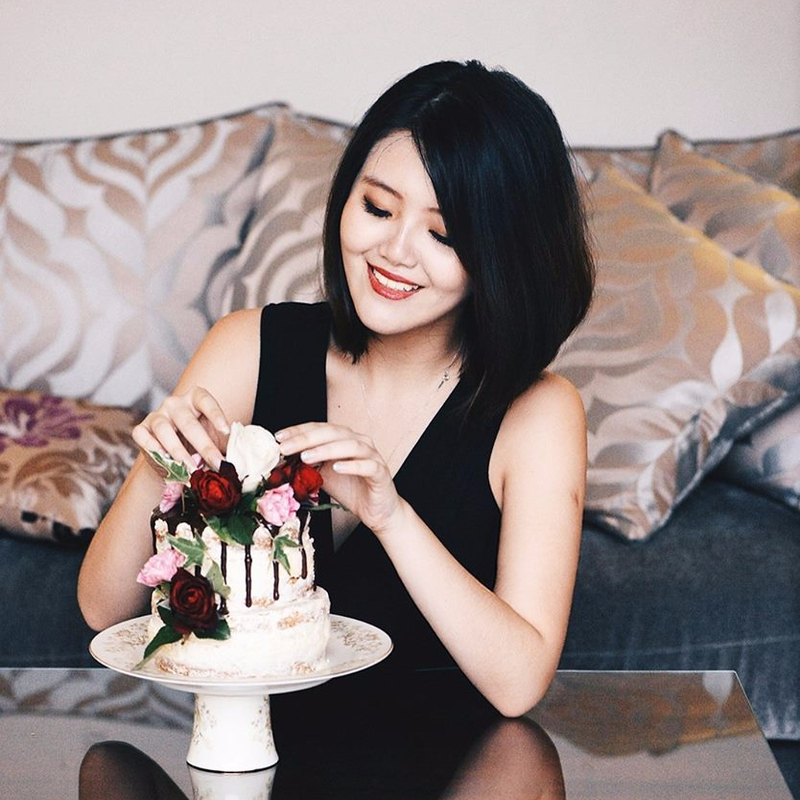 I’ll be hosting January’s Aspiring Bakers! Do check back on Jan 1st! Take care. Wishing you Happy New Year in all your days! Wonderful! Thanks for the step-by-step directions and a great recipe. Since Christmas is almost over, I’ll wish you a heartfelt Happy New Year! What a gorgeous yule log! It looks so soft and delicious. What great Christmas memories too 🙂 I hope you had a fantastic one Sammie! 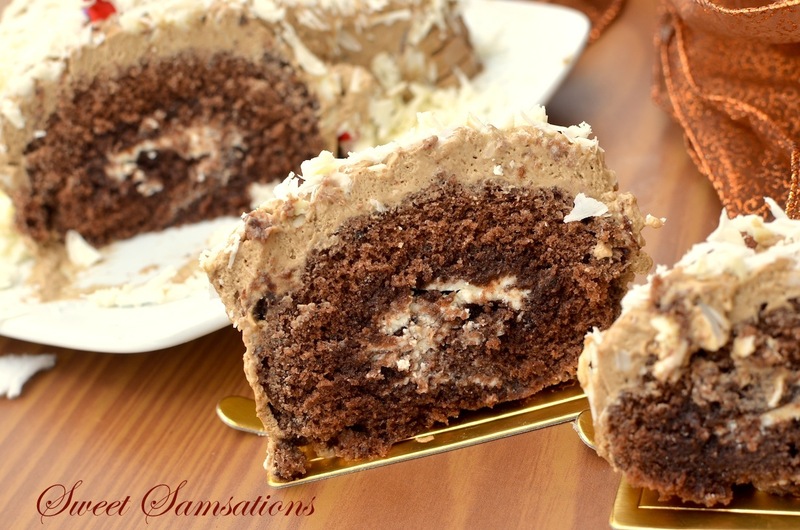 A Moist and decadent yule log…..Merry Christmas and Happy Holidays!! Hope you had an absolutely wonderful Christmas! It was so neat to read all about your experience with Christmases in the past -so interesting! And this Yule Log looks sooooo delicious. YUM! Merry Christmas! Scrumptious looking yule log. What a yummy, festive yule log!!! Merry Christmas (a few days late) and Happy, Happy New Year!!! Thanks Bam!! hmm! Yeah! There was quite a bit I changed but I won’t say it’s anything too hard for sure! I just changed my background, header and did a little reconfiguration with my footer. That’s all! I’m just really slow when I do these though. hehehe.. Take care too Bam! Great yule log recipe and Merry Belated Christmas! Hope you’re having a fantastic time in Indonesia. Lol thanks for the emphasis on whisking I love the image of what happens when you don’t whisk enough! Looks very nice Sam Sam! I’m so glad that you got to spend it with your loved ones, Sammie! I love how you decorated this delicious masterpiece! Glad you had a wonderful Christmas with family. 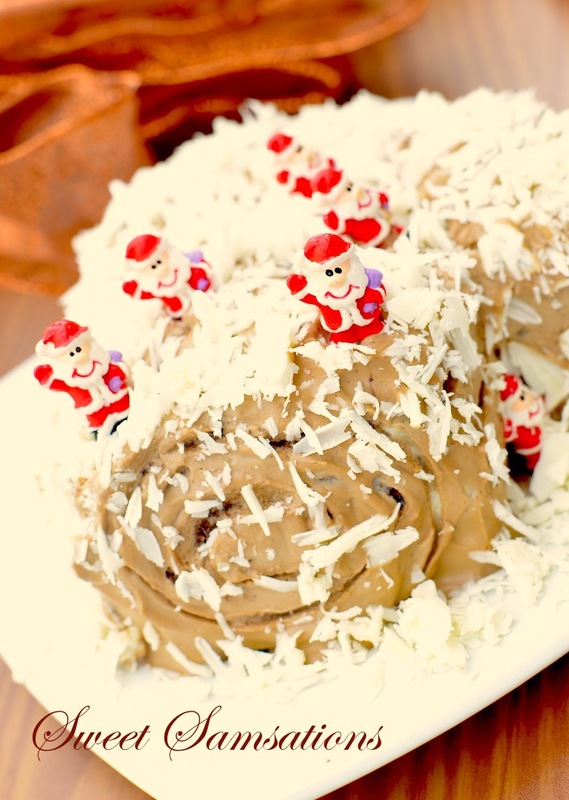 Love the santas on your yule log. Wow, this looks so delicious and scrumptious!! One day I want to make this but not sure when I can actually pull this off. Yours look perfect and delicious! Homemade one must be the best!